With the support of our dexterous team of professionals, we provide clients a high quality range of Rubber Bellow. It is manufactured from supreme grade raw material by our professionals possessing years of experience in their concern field. This bellow is widely used for protecting rod-ends and ball joints from dirt or oil penetrations. Our offered product is available in various dimensions, shapes and sizes that can be customized as per clients' requirements. Eshita Rubber Private Ltd., (formerly known as Eshita Rubber Products) was re-established in the year 2008 by business entrepreneur Mr. Ashutosh Durve. 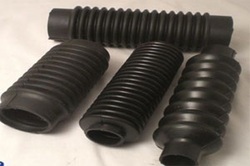 Company has a vision to become a leading organization in manufacturing specialized rubber products catering to Medical Sector, Automobile Sector, consumer durable industries and allied sectors. The company is known for manufacturing components from Viton, Silicon, Neoprene, Nitrile, EPDM, Poly Urethane, Natural rubber, etc. The company has state of the art Manufacturing and Testing facilities. The company has its factory at in Dist.-Thane - 401105. Company outsources mixing operation whenever required. Extruded products include Silicon Transparent sleeves, Tubes with minimum I.D. of 0.3mm, Hoses with / without braiding, channels Cord of 1mm and above, Gaskets etc. Molded components manufactured are ‘O’ rings, Grommets, Washers, Bushes, Plugs, Gaskets etc. The company is well equipped with in house test facilities to monitor quality during manufacturing. Company aims to provide on time, quality products to the customers and use knowledge of their well experienced Engineers and professionals, to enhance customer satisfaction on continual basis. To give confidence to their customers and to widen customer base, the Company has decided to obtain ISO 9001:2008 Quality Management System Certification by October, 09. Company intends to be certified for TS 16949 in another year’s time on getting ISO 9001:2008 Certification.